Emma Healy has grown used to being the only ordinary one in her rather extraordinary family. But when she finds a birth certificate for a twin brother she never knew she had, along with a death certificate dated just two days later, she realizes why she never felt quite whole. She sets off on a trip to visit her brother’s grave. Peter Finnegan, her neighbor, comes along for the ride. Emma thinks they can’t possibly have anything in common, but with each passing mile, they find themselves learning more and more about themselves and each other. There is nothing as lovely to me as a beautifully written book, and You Are Here is definitely a prime example. I was eager to start another book by Jennifer E. Smith and this was the first one I stumbled across in the library, so I took the opportunity to read it. I'm glad I did, as this book features some of my favorite things - road trips, self-discovery and a little romance. I adore road trip books. This one is pretty special because it picks out states that I've actually been to - like Virginia and New Jersey. The whole trip is pretty awesome, as they take a pretty unique car and just go on the trip. There's not much planning at all, and the whole aspect of them simply winging it appealed to me so much. Emma and Peter are both characters that I could see parts of myself in, and that's probably why I clicked with them as soon as I started reading the book. I could understand how Emma felt out of place in her family, which prompted her to search for clues to her true identity (in terms of where she belongs). On the other hand, Peter's quirky fascination with maps and traveling definitely reminded me of myself and the budding wanderlust in my heart. There are so many quotes that I wanted to remember from this book, as well as moments that I just felt like savoring. The writing flowed beautifully, but moved at a slower pace that I'm used to because of how descriptive it was. This didn't make the story any less enjoyable; in fact, it increased my enjoyment of the story. Honestly, I will warn you that it did take me a while to really get into this one, but I think that might have more to do with the timing of when I actually read it. It was a lovely story, and it ended perfectly, with important realizations for both Emma and Peter. You Are Here is quite a lovely story, and I'd encourage you to read it when you can really take your time with it. I adore road trips, too! I love when you come across parts that all you want to do is savor. Sometimes when I'm really impressed, I get all dreamy and have to take a moment to just take it all in. I read The Statistical Probability of Love at First Sight last month and loved it. It also took me a while to get into but after picking it up again the next day, I really started to enjoy it. Thinking about it, I think it was me, not the book. Very it's not you, it's me.. After reading Statistical, I'm looking forward to checking out more of Jennifer's work. Who knows, maybe I'll try this one next. 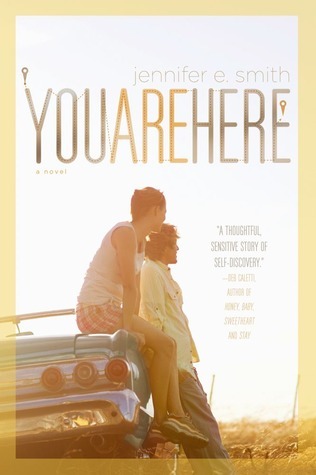 Oh Jennifer E. Smith and a road trip book? I'm definitely in! I also recommend Perfet Escape if you love Road trip books. Anyways I really want to read this one! Also good to know it took a bit to get into it. Great review, Alexa! This book sounds pretty awesome! This is my first time seeing it and the synopsis sounds heartbreaking and lovely. And it's a road trip book? Very cool. I'll definitely have to mark this down on my wishlist! I haven't heard of this book. But I loved The Statistical Probability of Love at First Sight, so I think I will give this one a try eventually. I am not really a huge fan of road trip books. I'm not sure why, but they rarely click with me. But I am always giving them a try. Hopefully this one one. Oohhh - being able to relate to BOTH characters? I need to get in on this action! oh I am the biggest fan of road trips and I likes the statistical probably of love at first sight by jennifer. I really want to pick this one up. I love a beautifully written book! I loved The Statistical Probability of Love at First Sight by Jennifer and after reading that, I have been dying for another by her. I think this one sounds like a great story! I love, love, love road trip books and it has been far too long since I've read one!